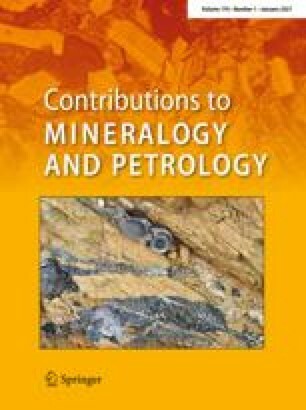 Stable isotopes and amphibole chemistry on hydrothermally altered granitoids in the North Chilean Precordillera: a limited role for meteoric water? Whole rock and mineral stable isotope and microprobe analyses are presented from granitoids of the North Chilean Precordillera. The Cretaceous to Tertiary plutonic rocks contain important ore deposits and frequently display compositional and textural evidence of hydrothermal alteration even in barren rocks. Deuteric alteration includes replacement of biotite and amphibole by chlorite and epidote, sericitization and saussuritization of feldspars, and uralitization of clinopyroxene and/or amphibole. While whole rock compositions are not significantly affected, compositional variations in amphiboles suggest two types of hydrothermal alteration. Hornblende with actinolitic patches and rims and tight compositional trends from hornblende to Mg-rich actinolite indicate increasing oxygen fugacity from magmatic to hydrothermal conditions. Uralitic amphiboles exhibiting irregular Mg-Fe distribution and variable Al content are interpreted as reflecting subsolidus hydration reactions at low temperatures. The δD values of hydrous silicates vary from −63 to −105‰. Most δ18O values of whole rocks are in the range of 5.7 to 7.7‰ and are considered normal for igneous rocks in the Andes. These δ18O values also coincide well with the oxygen isotope composition of geochemically similar recent volcanics from the Central Andean Volcanic Zone (δ18O = 7.0–7.4‰). Only one sample in this study (δ18O = 3.0‰) appears to be depleted by isotope exchange with light meteoric water at high temperatures. The formation of secondary minerals in all other intrusions is mainly the product of deuteric alteration. This also holds true for the sample from El Abra, the only pluton associated with mineralization. This indicates the dominant role of a magmatic rather than a meteoric fluid in the alteration of the Cretaceous and Tertiary granitoids in northern Chile.